Optimal Solutions provides a variety of options to get you started with the Sculptor family of products. 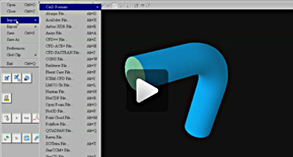 The following tutorials are available for learning more about real-time morphing capabilities provided by Sculptor Morph and Sculptor Morph Analysis featuring our unique Arbitrary Shape Deformation (ASD) technology. If you would like to better understand the capabilities of Sculptor and how Sculptor can help you in your applications, you can arrange a live demo with us or with a Sculptor distributor. The best way to really understand Sculptor and the benefits that you can achieve is through an evaluation. You can download your own full-featured version of Sculptor free of charge by registering at our Sculptor Support Site or by contacting us or a Sculptor distributor. Optimal Solutions offers a variety of options for licensing to meet your business situation and application needs. This includes the standard options for Annual licenses and paid-up licenses with maintenance, as well as project specific licensing to match the duration of your research. Please Contact Us or a Sculptor distributor to discuss licensing options.